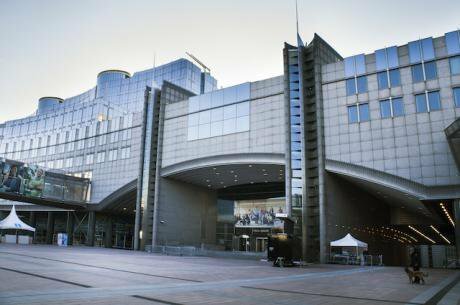 The Altiero Spinelli Building, European Parliament, Brussels, Belgium. Sojka Libor/Press Association. All rights reserved.With Europe’s current order in the spectacular débâcle that it is, a return to basics is in order to rethink the supranational construct, and the underlying idée européenne, from the ground up. For this, consideration must be given to the antecedents of the current European Project, particularly in Europe’s intellectual history, as well as some of the earlier suggestions for a political and, it is assumed, democratic, Europe. Furthermore, the concepts which make up the European idea need to be redefined and reconsidered. What I aim to argue is that Europe does not need a revolution, in the sense of the complete replacement of the very foundations of the European idea, but a reformation . We are not here to destroy Europe, but to reaffirm our belief in it, through challenging the core articles of faith, dismantling the redundant pillars of the construct, and regenerating them into something new. For a truly transnational Europe, there must be a Second Reformation; a real constitution lies at the heart of this. Here is my contribution to DiEM25's Constitutional pillar. There are nevertheless two major gaps in the manifesto, and one obstacle; the first gap is, while there is much dedicated to economic and social questions – which are certainly relevant to the wider question of a just and cohesive society – there is little dedicated to constitutional questions. They readily admit that given the uncertain nature of the future, they do not know the exact constitutional forms and can only prescribe that which we already know: representative bodies, the formation of law, independent magistracies and freedom of expression and association. They also argued for secularism; the clear separation of Church and State which the Mussolini regime had reneged on in order to gain the support of the church and his religious countrymen. One area they are clear on which links constitutional questions with socioeconomic questions is the theory of corporatism. Spinelli and Rossi’s European Federation has a strong democratic element at its very core, “giving the solid stamp of liberty to political life, imbuing it with a strong sense of social solidarity”; this is not compatible in their reckoning with corporatism, experience with which they have from Mussolini’s fascist regime in Italy. They do not believe corporatism can be salvaged for democracy, being a key element of fascism’s “house of cards”; representatives of the various sectors of the economy, even if sincerely representative, are not qualified to handle questions of government policy, for they become organs of the accumulation of power and privilege depending on who has better representation – and hence, access to government. This is very reminiscent of business-lobbying today, where corporations aim to bypass the parliamentary process to gain direct access to government, which they are able to do, and more effectively than other sectors of the economy (especially labour) thanks to their wealth and connections with the political class. Unfortunately, this is the model that technocratic Europe has chosen to base its ‘representative’ government on, which I believe links back to a liberal-individualist conception of democracy and ‘Roman’ strategy of legitimacy. Through corporatist methods, the wants of the people are determined and then technocrats can fashion policies to satisfy those wants; it is a hollow form of democracy, stripped of all normative value or potential. The manifesto tells us the end result: “This would create a kind of feudal anarchy in the economic life of the country, leading to renewed political despotism.” We see it now, different fiefs – banks, industrial manufacturers, pharmaceutical companies etc. - vying for power and influence over the centre, completely disregarding other interests, the common interest and the greater good of the whole, their influence based entirely on who has the most slick and effective representation, rather than equal representation of all. The simplest answer to ‘why Europe?’ is because it’s already here. Like the nation-states before it, which existed before they were democratised, the European Union exists and provides an object to tame and influence, rather than starting from scratch. Yanis Varoufakis made a similar point in a meeting in Belfast in 2017; that since the eighteenth century, the Left believed the state, though a bourgeois construct, should be transformed rather than dismantled. So is it for Europe, now it is here. On the question of why it is here, we learn more. Europe’s stories, though varied, have always been intertwined and interlaced with elements from each other. Europe’s cross-border tradition, its highly-enmeshed economy and society; these things have been attacked by national states, but not destroyed, and they provide the ground-work for the current Union. The Union made the crucial step in 1951 then, in breaching ‘the ramparts of national sovereignty’, and undermining the national narrative. This must be built on: why not use Europe as a force for transnational society; why not make the first steps across national borders; and why not use the heritage that Europe has, of borders crossed and boundaries blurred? A place which values diversity in its lived experience like nowhere else in the world. Why not begin at a level which is attainable, in terms which can be understood better, in a territory which has already begun the steps towards transnationalism, namely, those breached ramparts? Why not demonstrate that 'beyond-the-national' can be democratised? In response, many would argue that in creating a European state, you would simply create the national writ large, which betrays the very éthos of Europeanism. Here we turn to Müller and identity. In this way, it is also not cosmopolitan universalism; primarily in the ties to specific institutions which enable and are moulded by discursive engagement with universal values, and in rejecting the assumption that all humans enjoy the exact same political-moral relationship with one another. Hence, the process of self-critical and reflective engagement with one another creates a source of identity, as the sharing of a common political struggle creates attachment not only to the principles of that struggle but also the people who took part in the struggle. This connects directly with Spinelli and Rossi’s prefacing of the Federation with a society that is not servile; they criticised the nation for having become a ‘divine entity’, which considers only its own existence, and hence, the identity underpinning such an edifice had to be servile. Müller invites Europe to consider a new identity, which is not as passionate, nor as unquestioning nor possessive as nationality, but nor as cold as rational universalism. Globalisation is not an all-powerful melting pot which obliterates particularity, nor should it be. It has been recognised that postmodern Europe is awash with identities; these can be turned into a binding, united identity only in a discursive and critical process forming a civic identity, which would then characterise the state which it built. Moving from the national - particular - to the global - universal - cannot be made all at once. But it must be shown that it can be done, that national boundaries can be superseded; that an identity that is post-national and post-ethnic can be created on the basis of civic, democratic values and processes; that peoples can live in harmony with different cultures, with different languages, with different understandings of history - and that these can be bridged also, through conscious effort and democratic discourse. A dynamic, evolving identity. This civic, rather than ethnic, identity goes deeper, connecting directly with the core of democratic government. Currently, democracy is underpinned across much of the west by ‘liberal nationalism’. If constitutional patriotism enables us to think beyond the national, then perhaps the popular foundation of democracy – the dêmos – can be stripped of its nationality – éthnos. The purpose would be to bind it to a political structure that is also post-national, and enable that political structure to exist without the trappings of national identity and ‘nation-statism’ which Mitrany and others fear. The polity would embody the discussion conducted by a critical and reflective dêmos. An additional binding element, alongside the definition of constitutional and institutional specifics (which would evolve) and discussion of the legacy and meaning of the past, would be the seizing of a common télos - destiny - usually attached to éthnos, but appropriated in the name of democratic government. The dêmos united by its collectively determined télos, a process guaranteed by constitutional structures at the heart of which are universal values. What would define the European sphere is the absence of a single éthnos giving legitimacy to its political structures; these would be legitimised instead through the democratic process undertaken by a dêmos which had defined its own existence on the basis of universal values; as Habermas said, peoples emerge only with their constitutions and states. The relation between the dêmos and the European Federation could not be but symbiotic; there would be no ethno-cultural justification for the state. It would embody a common process, a democratic one, rather than a common ethnicity. This has brought us from the simpler why Europe, to the more pressing how Europe. We turn now to the outstanding obstacle: Ventotene was explicitly crafted for the context of a revolutionary moment - specifically, where the authors believed democracy would be ineffective. It is clear that, while Europe may be in crisis, this has not reached a revolutionary moment, and nor should we wish it to. Democratic methods, and related, constitutional structures, are that which we work with, returning to the first gap in the manifesto. As Rousseau said, commonly crafted institutions and laws give character to a people – or peoples united by a single politics. It is important to note that government is not simply the institutions which shape it, but also the constitutional and political culture which informs it. The latter is fundamentally a question of values; these we have defined to an extent, in speaking of universal values. Both Zygmunt Bauman and Wolfgang Münchau have articulated specific universal values which should be at the core of Europe’s raison d’être. Bureaucrats do not wield their power openly, because they cannot - it is power which is not theirs but which they have been loaned by people who do possess mandates. Therefore, they must whisper in the ears of ministers and statesmen, hoping to convince them secretly and then mercilessly execute their supposed orders as if they had no choice. The wielding of such power - pretending to have none beyond following orders while in secret influencing those with authority - is despotic. Crucially, it has seeped into every nook and cranny of the European construct: "The operative maxim of the EU has become Brecht's dictum: in case of setback, the government should dissolve the people and elect a new one." It should become clear then, that the imperative to democratise Europe is not just a technical illegitimacy – a trick of constitutional law – but an urgent priority to remove the ‘cartel of elites’ and their influence over European society, both for the sake of those in Europe, and as a challenge to this mode of rule across the globe. Transnationalism is an alternative to this mode of rule, which has the democratic imperative placed at its very heart, hence making it the keystone of this second Reformation of Europe. Transnationalism is an alternative to this mode of rule, which has the democratic imperative placed at its very heart, hence making it the keystone of this second Reformation of Europe. The Statute of the European Community was Europe’s first attempt at political unification, and yet has been described as one of the most elegant constitutional documents to have been proposed in history, and one that should be a template for future European constitutions. The federalist Guy Verhofstadt laments Europe’s failure to have its ‘Philadelphia moment’, when we could have carried the baton of political union over the finishing line and provided answers to the debates we are having in the current Union. Monnet did not believe Europe was ready to make this step in 1954, when the Statute was rejected by the French Assemblée Nationale, however, Verhofstadt sees it as Europe’s greatest mistake of the post-war era. Unlike the 2004 constitutional treaty, the Statute was not overwhelmed by legal jargon and was hence compact. Furthermore, its aim was clear: to found a European Federation and a new, supranational sovereignty, underpinned by democratic institutions - recognising the legitimising authority and power of a representative parliament, which Verhofstadt points out, is not recognised in the current Union. It provides for the representation of citizens and collective nations; it recognises that the Statute, rather than member-states arbitrarily, confer competences; it ties the supranational executive’s authority directly to the parliament – which has full legislative power - and separates the executive’s members from any corporate entanglements; it restricts the intergovernmental Council of Ministers to a secondary, harmonising role; it establishes a fledgling federal judicial system; it restricts corporatism to a purely advisory role; it prevents an increase in bureaucracy by relying on the established principle of indirect administration; it provides it with spending power under parliamentary control, necessary for a government to enact its agenda; and it establishes an enumeration of powers. There is an echo of the Swiss system in this document, along with the German one, courtesy of the influence of von Brentano who was involved in the drafting of the German Grundgesetz. The Statute combined with the Spinelli Treaty offers the basis of what I believe should be the institutional shape of the European government, though there are of course sections we can dispute and alter, and we must bear in mind that no constitution is – or can be - perfect. A number of influences can be determined as to the nature of the construct the drafters of these treaties were trying to build. To these I wish to add further elements based on three further political theories, blending with the already-present influences and together making the European construct more distinct, and ensuring that it serves the transnationalist ends defined above. These theories are: the Kantian pacific federation; republican democracy; and federalism; together they will be underpinned by the idea of a civic dêmos with universal values, facilitating a constitutionally patriotic identity which will hold the edifice together. The fundamental precept is that Europe should have a constitution which repeals all of the treaties and replaces them with a document, the legitimate authority of which originates from the European peoples. It is they, not the nation-states, who are the pouvoir constituant of the Union. With this foundation laid, we can turn to the first theory, establishing the Preliminary and Definitive Articles of Perpetual Peace in the European pacific federation. The fundamental precept is that Europe should have a constitution which repeals all of the treaties and replaces them with a document, the legitimate authority of which originates from the European peoples. It is they, not the nation-states, who are the pouvoir constituant of the Union. In Perpetual Peace: A Philosophical Sketch, Kant gives a series of ‘Articles of Perpetual Peace’, which would end the ‘State of Nature’ between states (which he called the State of War), and bring about the ‘State of Peace’. It is the definitive articles which demand our attention – they are: “The civil constitution of each state shall be republican”; “The law of nations shall be founded on a federation of free states” (the pacific federation); and “The rights of men, as citizens of the world, shall be limited to the conditions of universal hospitality”. In the term 'republican', Kant meant that firstly all members of society were recognised as free and equal citizens subject to the same law, that citizens were represented in a government which acted by their consent, and that executive and legislative power were severed from one another in government. The first and second are recognisable today and are part of our modern understanding of democracy. The third Kant believes is in conflict with democracy, as his idea of severed executive and legislative power is that the two must be exercised by different classes of society; citizens may have legislative power but executive power should be exercised by a monarch or aristocracy (which he favoured). A democratic form of sovereignty (‘forma imperii’) is in conflict with a republican form of government (‘forma regiminis’); it is instead a despotic form of government. On the one hand, Kant argues significantly that a small, un-bureaucratic executive must be combined with a ‘real’ representation of the people for republicanism to be fulfilled, and this makes sense to me as well (note, small executive should not be confused with the idea of the minimalist state of Hayek’s imagining; the state should not be passive, for it is a tool the people use to exercise their sovereignty and ensure just, effective government. Such an understanding enables a more nuanced approach to the use of power justified by majority-support. Republican liberty is the idea of freedom from tyranny; this, among others, is a value which guides the use of state power by the dêmos. Hence, action by the dêmos cannot be tyrannical, justified by majority-support alone, but instead must be informed by these values for it to be legitimate and democratic. Democracy understood in republican terms is at the service to higher values - isegoría, liberty, solidarity, justice and diversity - defined and redefined collectively through discourse within the enlightened civic dêmos. At the heart of this interpretation is the need of society to reconcile ‘the unison’ with ‘the polyphonic’; that is, plurality with the need for common courses of action. That means the plurality of voices is respected - through the values of isegoría and liberty. Republican democracy demands both freedom from tyranny and the seizure of fate; autonomy on some issues, collectively-exercised sovereignty in others. Crucially, this places a heavy emphasis on the organisation of democratic politics. The current European Union fails miserably in this regard; the void of citizen politics has allowed economic interests to be privileged, exacerbated by the roots of the current institutions as a cartel-administration - hence the cast of the Competition Policy, trade relations, capital markets, the Common Agricultural Policy and emphasis in the eurozone on deregulation and austerity. These emphases are the hallmarks of institutions entirely orientated towards big capital, without any other points within its frame of reference; there are no other objectives and ideals within the agenda of the Brussels institutions. Corporatism intensifies the technocratic structure of the Union institutions: it nullifies the harmonising and pacifying effects of democracy, leading to incoherence, allowing big capital to exercise huge amounts of power over government, and the working classes to be appeased but subordinated. It is thus not surprising that neoliberalism has easily been adopted as the working-ideology of the institutions, as well as the idea that citizens are not still divided by class. This means the impact of the omnipresence of class within the body politic is neglected. By contrast, Spinelli and Rossi invoked us to build a society where we can act as equal citizens; where wealth and power disparities were not so great, where liberty was combined with solidarity, where politics was inclusive, democratic and respectful of the minority, where citizen autonomy and freedom were valued and meaningful across society’s classes. This is the project of the federation. Social justice and solidarity are instead at its core. The autonomy of the sub-continent’s nations must be recognised in their construction of constitutional democratic governments. Only they can have the authority to accede to the European Federation, adopt the principles of, and integrate themselves into the common dêmos. No one has the right to force them. The continued presence of the éthnoi within the Federation determines its boundaries; it itself is a purely civic entity, guided together by a single dêmos. It is given life, shape, direction and boundaries by the ethnic nations which accede to it, and in so doing, accept the opening of their borders, a commonly defined télos, a common discussion of the past (which grows with each éthnos which accedes), and the fundamental idea that these things can and should be shared with ‘others’, in a diversity which strengthens us all. The civic-state thus acts as a vessel – all the components of which make it universal - which needs to be filled by the particular national interpretations and historical experiences to turn it into something which has substance in the real world – to make the universal tangible. Varoufakis V. Adults in the Room: My Battle With Europe's Deep Establishment. London: The Bodley Head. 2017.